The Festival is aimed at promoting the interaction between cultures in the field of folk art. 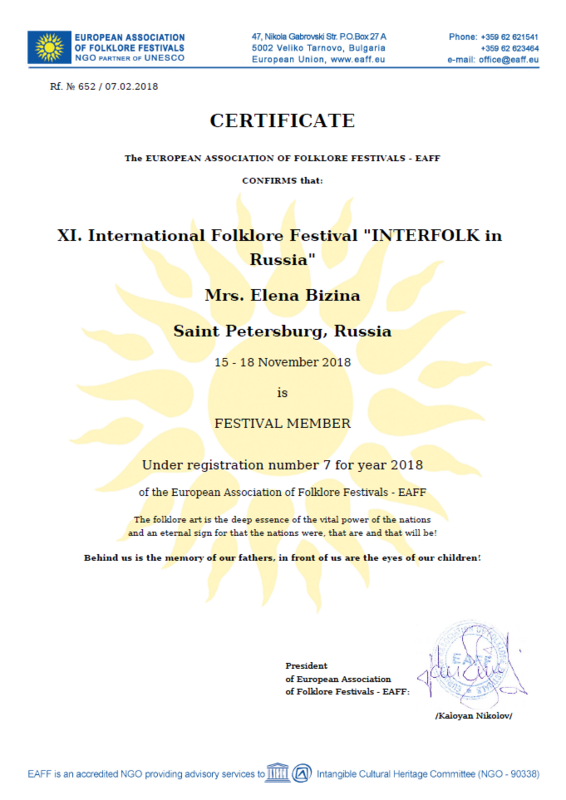 The main idea is to bring together the groups and ensembles from around the world in St. Petersburg in order to further the cross-enrichment of cultures and promote international cultural cooperation. Another objective of the Festival is to hand national traditions down to younger generations, so that they would keep the national heritage and develop new forms of intercultural dialogue. For other participants: excursions to St.Petersburg museums and famous places. The participants can arrive some days before the festival and depart some days after event. Attention! The Results of the contest and the awarding will be held during the 2nd round. Announcement of nominees for the Grand Prix will take place at the «Evening of Friendship». NOTICE! Phonogram (+) for vocal groups in CATEGORY A, B and C is NOT ALLOWED! The open fire is not permitted during the performance! The participants pay the contest fee no later than October 15, 2019. In case of refusal to participate in the competition after October 15, the fee is not refund.